I enjoy how an image can capture a moment that may have an entirely different feeling than what you perceive as you see it in real time. Here, this dowitcher was actively preening and doing his best to get that overly long bill to properly reach his front feathers. But when the shutter clicks, the scene is transformed into a very solitary moment. 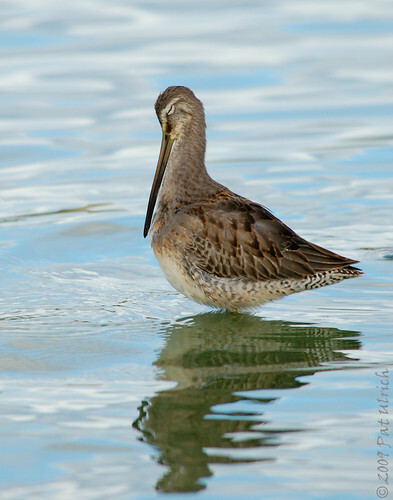 To me at least, it gives the feeling of silence and a quiet introspective, as if the dowitcher is taking a moment to relax, close his eyes, and just be. Hi Pat - love your photos! This is so incredibly serene Pat, certainly one of the loveliest images I've seen you capture. Just excellent Pat, as always. The blog is superb, keep it up! Love the shot, Pat. Also the explanation. It's an interesting facet of still photography.